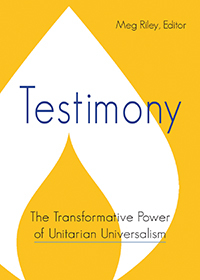 You’ve maybe heard that “Unitarian Universalism is the faith where you can believe whatever you want.” Michelle Ma points out that this is not true–that being a Unitarian Universalist and living according to Unitarian Universalist ideals is hard work and that there are, in fact, certain things you might need to believe. She’ll also help you get started on an “elevator pitch” so that you can explain to others what UUs believe and how our justice work is grounded in faith. Please join Worship Leader Steve Thomasberger and Worship Associate Lynn Gallogly as we contemplate the role of education, learning and teaching in our lives. As a long-time educator reflecting on his 25-plus years as a teacher, principal and administrator, Steve will share his hilarious, sometimes heart-breaking and always heart-felt experiences with us. We will be discussing the state of our schools today and what we can do to help shape the future. We will also recognize the role of our congregation in mentoring students at Lafayette School in West Oakland through the Boost! West Oakland project. John Shinnick and Joe Cristofalo will offer special music for the service. Our celebration of Black History Month continues. What role did historic Oakland, California play in shaping the multicultural, multiracial world that we live and play in? Pianist Geoff Ullerich, Guitarist/Vocalist John Shinnick, Joyful Noise, Worship Associate Lynn Gallogly, Rev. Sheri and Rev. Jacqueline are the co-creators of worship and are expecting you. Our Black History Highlight will lift up the rich music of Mahalia Jackson. Please come with your loved ones and your neighbors. All are welcome. Is it possible to live with the steady unrelenting tensions of our times and to authentically connect to our divine nature? What do the arts have to tell us about finding and living this balance? We will ponder a Welsh Tale “Why Deunant Has the … read more.